Library - a collection of functions used to write web apps. Your code is in charge, and it references the library when it needs to. Framework - a particular implementation of a web application, where code fills in the details. The framework is in charge, and it references your code when it needs something app specific. Let’s compare features that are similar and review how they differ. Data Binding is the process of establishing a connection between the application UI and the business logic. If the settings and notifications are configured correctly, the data reflects changes made in the UI. This also means that when the data is changed, the UI will represent that change. Let’s analyze the differences. 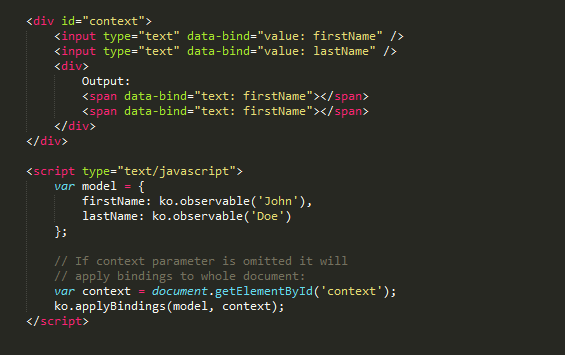 In the HTML syntax for Knockout everything is done using the data-bind attribute and appropriate binding type; however, the need to specify all properties as observable requires additional effort. Mappings need to be performed when loading JSON data from the server to convert properties to observables. There is a mapping plugin that can be used to make this easier, but it is your responsibility to manage the mapping when retrieving data and when sending data back to the server. Angular syntax for outputting values is much simpler and compact. It makes it easier to read and compose. The major difference is the binding methodology. 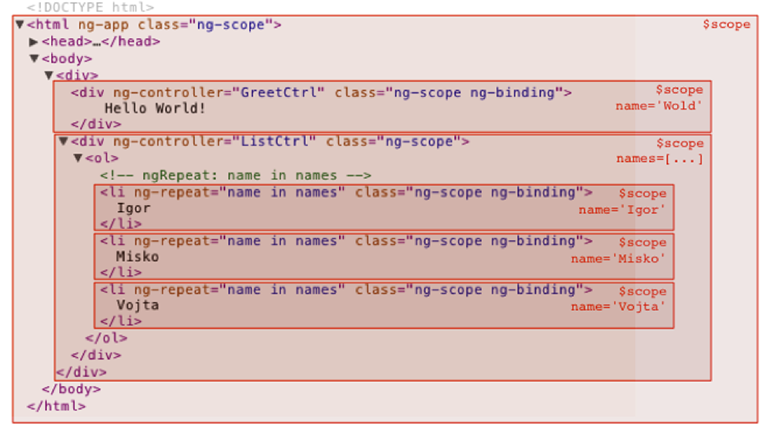 Where Knockout binds to the provided model, Angular binds to the special $scope object. Both libraries support templating. This helps break code into small, maintainable pieces. Equivalent functionality can be implemented in Knockout by writing custom bindings. Both libraries come with built-in directives and bindings, and although these examples are very basic, they show how each library can be extended to be more sophisticated. Knockout uses the Observable pattern to track changes and notify registered subscribers. Because Angular works with plain objects, it observes variables using a dirty checking technique. Every time an expression is evaluated it compares current object values with previous object values. Modules - a module is a container for a set of components. 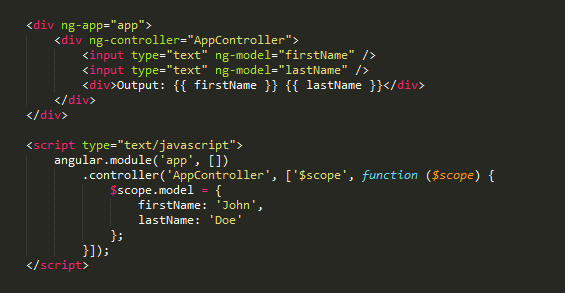 Those components can be controllers, services, filters, directives and etc. From .NET or Java perspective, a module is more like a namespace. It enables you to package code into reusable components. Modules can reference other modules. They serve as application building blocks. Dependency Injection - the Angular injector subsystem is in charge of creating components, resolving their dependencies, and providing them to other components as requested.  Form Validation - form and controls provide validation services, so that the user can be notified of invalid input. When working with Knockout, this functionality is not available in the core library, but can be added by using external libraries or custom logic. Routing is a great feature that allows management of application states. and back/forward browser history navigation. Knockout does not support routing. AngularUI Router is a routing framework for AngularJS, which allows you to organize the parts of your interface into a state machine. 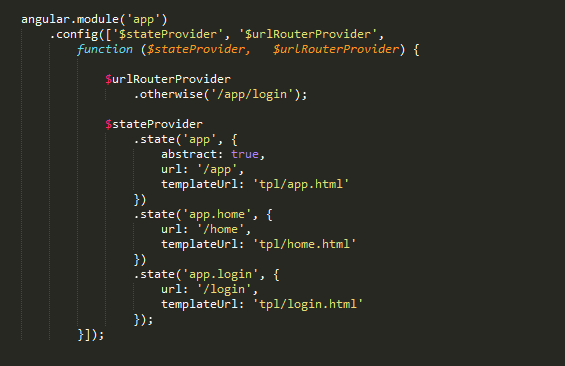 Unlike the $route service in the Angular ngRoute module, which is organized around URL routes, UI-Router is organized around states. States are bound to named, nested and parallel views allowing you to manage your application's interfaces with ease. Additionally, states can be nested within each other. Angular is written with testability in mind, but it still requires some additional effort to integrate a test framework. Protractor is a a popular end-to-end test framework for AngularJS applications. Protractor is a Node.js program built on top of WebDriverJS. Protractor runs tests against your application running in a real browser, interacting with it as a user would. Knockout apps can be tested using similar methodologies, however, Knockout does not inherently result in testable code. Knockout documentation for data binding syntax is extensive. Utility methods provided by the library are almost not existent. Angular documentation is very well organized and has tons of information including interactive examples. The learning curve is steeper for Angular, as the library is much more conceptual and wider in application. Knockout has a low barrier of entry, but is also harder to manage when code base and complexity grows. It is not easy to build the necessary infrastructure correctly, and poor decisions made in structuring code may cost a lot to fix in the future. Angular’s ability to bind directly to plain objects, modular structure, and strict development guidelines prevent many issues right from the start, and provide a strong architectural foundation for the application.